Caremark Midsussex and Crawley is a Sussex based homecare provider and franchisee of the Caremark company. They pride themselves in being one of the top performing in-home care service companies in the Sussex region. Providing regular social care visits in their own homes they help their clients remain comfortable and independent. Their services include personal care, domestic tasks, shopping, companionship and they service a range of different clients from young to old, injured and ill as well as those with physical and mental challenges. Caremark Midsussex and Crawley found that the demand had grown so much for their exceptional in-home care services that they were in desperate need of hiring additional staff to cope with the new business. Their previous recruitment efforts weren’t getting them the results they needed so required us to provide a new recruitment solution. It was clear to us that Caremark Midsussex and Crawley needed a large deal of ‘outside the box’ thinking to ensure that we could work together to raise the number of applicants and subsequent hires. As a franchisee of a larger company their job adverts were all done through the main Caremark website. The website is great for customer acquisition but the recruitment section for Caremark Midsussex and Crawley was performing very poorly, and without access to the data around this page they were operating in the blind. 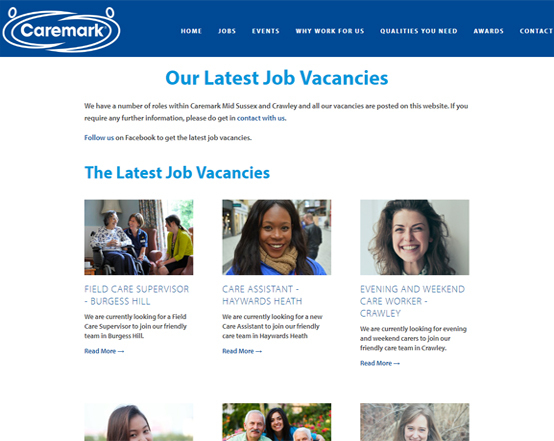 As their recruitment pages were part of the larger Caremark site, any job updates, edits or new listings took a long time to be processed and published. Furthermore, the amount of applications and subsequent hires they were receiving was far less than they needed to ensure they met the growing demand for their services. We created a stunning new website for Caremark Midsussex and Crawley to act as a recruitment site purely for their franchise. This would allow them to have full control of the jobs listed and any edits or updates that needed to be done could happen immediately. We created compelling copy for all of the positions that needed filling, ensured that every part of the site was optimised for user experience and that every part of the new site encouraged users who landed on the page to apply for a job then and there. 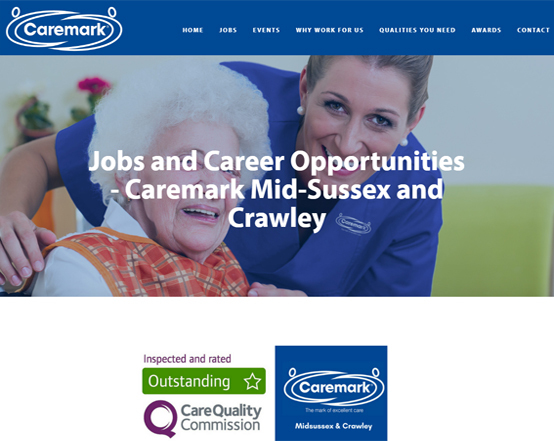 Once the website was created and optimised we needed to drive pre-qualified traffic to specific job pages in order to generate applicants for Caremark Midsussex and Crawley. We set about optimising the pre-existing Facebook page, ensuring everything was up-to date, relevant and complete. From here we started to populate the Facebook page with a mixture of industry relevant information as well as some job advertisements. We then promoted the job advertisements and tracked their progress so that we could get a clear picture of what our target audience might look like. From here we really ramped up the marketing efforts in order to drive large numbers of traffic to the site. By using a mixture of different imagery and wording we constantly tested and re-tested what was working and what was not to ensure that we were getting the best results. We employed a number of tactics to not only increase paid reach but also quadruple the amount of organic reach each post was getting over and over again. These combined tactics ensured that we were generating a huge amount of organic reach with our advertising, which in turn was resulting in large numbers of people going through to the recruitment site. Caremark Midsussex and Crawley found that the number of successful applicants coming through doubled from what it had been previously, allowing them to meet the demand of their increased work load. Not only that but the insights they received through tracking users coming through to the site and applying helped them further with their offline recruitment advertising efforts. Employing a new member of staff to handle community outreach and recruitment (who found the job on Facebook through one of our campaigns), they furthered the effectiveness of their recruitment by better understanding who to target with their campaigns.